"This is an easy yet impressive looking appetizer which works well for casual gatherings and more formal ones. I made these for a cocktail party at my home and they went fast." Preheat the oven to 400 degrees F (200 degrees C). Separate the pita breads by cutting around the outer edge, and carefully prying the halves apart to make two rounds out of each one. See how to make a warm tartine with goat cheese and fresh peaches. This was my first time using goat cheese, so I don't know if it was me or the recipe but this just did not turn out how I had hoped. The cheese dried out instead of staying creamy or melting. Definitely a dish for those with distiquished tastes. Not for everyone but personally i loved it! Delicious and gorgeous. I actually used a thin pizza crust and made a large pizza instead of individuals. Also put chopped black olives on one side. This was excellent! We added carmalized onions and portabella mushrooms to it as well! These were amazing! 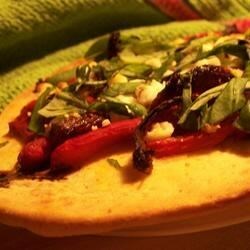 I made them with 5 flat breads (not split) and used the same toppings and loved it. Took them to a party and they disapeared almost immediately.